So I've seen this 'issue' for years but never addressed it. I work via Lightroom and have a massive catalog, so no plans to switch, but want to try an alternate RAW converter for certain images. So we know that your camera, LR, other software etc each create their own previews of RAW data in order to actually show you the image. These previews are different between platforms. I'm sure many have noticed that when LR imports an image, that image can suddenly 'change' as LR creates its own preview (color/contrast etc). Though I'm not sure how the original preview - what you see in import window - is generated (from the camera?). Usually this change is minor and insignificant. I've noticed with pelagic blue water images (especially recent ones of humpbacks in less than perfect vis) that change can be rather dramatic, becoming more 'muddy', darker, less base contrast etc than in the import window or in-camera. For an image that may already be a bit underexposed and low contrast, its painful to see. Of course I can edit them till my heart's content and I'm very proficient at doing so, often combining RAW conversion with Topaz/Nik filters in PS to get the image where I'd like. All good there, though advanced tips always welcome. But at times it feels like a poor starting point, hard to describe. So I'm thinking to try some other RAW converters and see how they come out. Anyone with any experience regarding this? Any suggestions for alternate RAW converters?? .......well I feel I should try and illustrate, but its tough to show. Here is camera vs computer, but I know screens never look the same, camera lcd's are bright. Still its quite dramatic on this humpback over/under. Highlighted image on top right (darkest) is original unprocessed RAW, exact same as image seen on camera. Far left has some basic adjustments, including +1 stop exposure which gets it to the similar exposure as it looks in camera. Problem is - for this type of image - you dramatically lose exposure latitude past about +1 stop. Contrast too, the whale pops nicely in camera, blends into water in LR. I know how to work with it, but it feels like I'm starting with a disadvantage. Try capture 1, there is a 30 day free trial. What lightroom brings up is a preview based on the presets it reads from the raw file. I believe you can develop your own presets to use, just google lightroom custom presets. The camera shows the embedded jpeg which has had some processing in camera. The contrast issue is always going to be there because quite often the range of tones as shot does not produce a full histogram. In the case of the split shots I imagine the UW section is going to be a little under exposed without flash so is going to need seperate work on the shadows. If you also use photoshop you could try the Tony Kupyer luminosoty masks tool, allows you to automaticallygenerate a mask to do a curves adjustment on lights, darks and midtones separately, be great for those split images. Thanks Chris. I'll look into LR custom presets, no idea how those work. I do already have the TKActions luminosity masks, though don't find them too useful for over/unders. Prefer other methods. That aspect of editing I'm quite comfortable with, but thanks for the suggestion. Definitely thinking more in the baseline RAW process realm, seeing if I can find a better starting point, closer to the camera generated jpeg which in this case is dramatically different from LR's preview. Will certainly try Capture 1 with the free trial. Cheers. 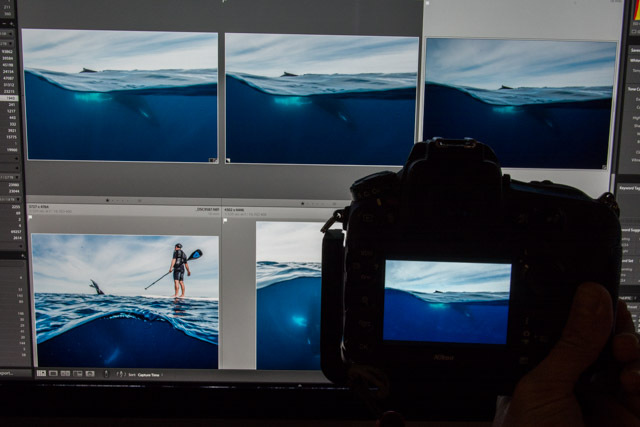 Being a Canon shooter I found that my blue water photos looked much nicer when I use the Canon Standard profile instead of the default Adobe profile. The Canon Standard profile is what my cameras are set to produce the JPEG that is shown on LCD after you take a shot.